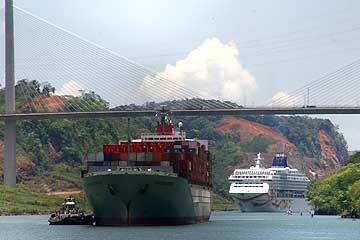 Panama Canal is a man-made canal in Central America which joins the Pacific and Atlantic oceans. One of the largest and most difficult engineering projects ever undertaken, it had an enormous impact on shipping between the two oceans, replacing the long and treacherous route via the Drake Passage and Cape Horn at the southernmost tip of South America. A ship sailing from New York to San Francisco via the canal travels 9,500 km (6,000 miles), well under half the 22,500 km (14,000 mi) route around Cape Horn. Source: Wikipedia. 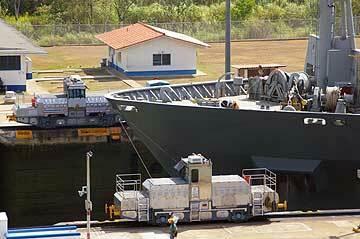 Initially the locks at Gatun had been designed as 28.5 meters wide. In 1908 the United States Navy requested that the locks should be increased to have a width of at least 36 meters which would allow for the passage of US naval ships. Eventually a compromise was made and the locks were to be constructed to a width of 33 meters. 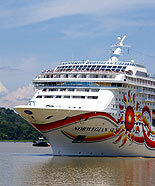 Each lock is 300 meters long with the walls ranging in thickness from 15 meters at the base to 3 meters at the top. 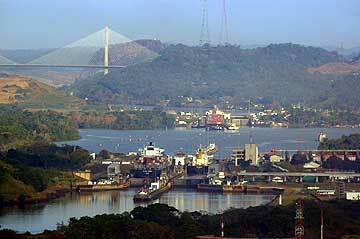 The central wall between the parallel locks at Gatun has a thickness of 18 meters and stands in excess of 24 meters in height. The lock gates are made from steel and measures an average of 2 meters thick, 19.5 meters in length and stand 20 meters in height. Source: Wikipedia.